Pretty Nice in the South of France, about as pretty as a postcard. Everything is clean and organised – white marble statues sparkle, scooters are parked in neat rows, and everywhere you turn there is a pot of coloured flowers brightening up the space. Walkers, joggers, cyclist and families on a day out enjoy the seaside promenade that overlooks Nice’s stony beach. The azure colours of the sea really set the holiday scene. Antique markets on Monday, and a famous flower and produce market every other day sees the Old Town of Nice teeming with life. Cafes and restaurants flank each side of the market as tourists snap away and bright potted flowers, scented soaps, neatly stacked oranges, tomatoes, and zucchini, as well as cherries, strawberries, blueberries and fresh red currents in little punnets, designed to eat now. Locals scurry past to buy their daily provisions and leave the bustle as quickly as they can. Socca, a chickpea flour pancake, is famous and some say a must try in Nice – the most famous is Chez Theresa. We didn’t try it as the queue was too long and a Bistro lunch was calling. Nice is a very appealing tourist town. But because it is a tourist town, eating out can be a disaster, as we discovered on our first two meals out. You can read about how to choose a good restaurant in my previous post – or click here. There are so many visitors in Nice that it’s hard to spot the locals. 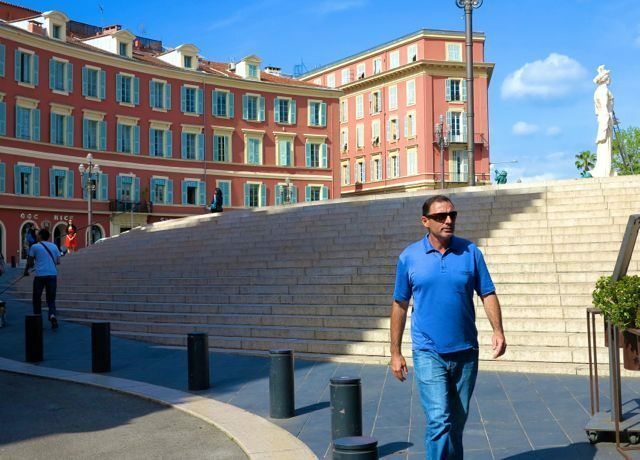 Nice is an easy city to navigate, and a great base for exploring the Cot’é Azure with day trips to Monaco, Cannes, Grasse and a myriad of pretty little towns in-between close by. We visited Monaco, Cannes, and Saint Jean Cap Ferrat. All are beautiful and worth a visit if you have time. We didn’t get to Grasse or to Saint Paul – a horrid cold prevented us for venturing too far for a few days during our stay. This very pretty teeny town is only about 20 minutes by bus (catch bus 81 from Place Garibaldi, 1.50 euro each way). There is a gorgeous 2km walk around the cape that is easy, as in paved walkway and relatively flat, and offers stunning views. The Captain Cook restaurant was recommended to us, but it seems to only be open for dinner. We opted for a gelato instead. We visited Monaco twice – once for the F1 Grand Prix, and a few days later to have a better look at the little principality. We walked around where the race pits were, part way through the famous tunnel, and right around the port to the end, then for 2 euro, caught the harbour crossing boat to get to the other side. The Casino is where all the action is. The most unbelievable cars you’ll ever see are either parked out the front, or drive by. Lamborghinis, Ferriaris, Maserattis, Bugattis, Aston Martins, Rolls Royces, you name it, you’ll see it there. We had a very expensive pint of beer at the Cafe de Paris (16 euro each, A$24) and watched how the other half live. Monaco is just 25 minutes by train from Nice. The Cannes Film Festival had just finished when we visited Cannes. As such, we couldn’t get into the original cinema that Cannes is famous for. We walked through the town, admiring the gorgeous buildings, cute flower pots, and stunning shops. Around the harbour, we gawked in amazement at some of the biggest boats I have ever seen – most were bigger than our townhouse in Perth, much, much bigger. We had a fabulous lunch at Five Hotel, Sea Sens Restaurant, before catching the train back to Nice (30 minutes). 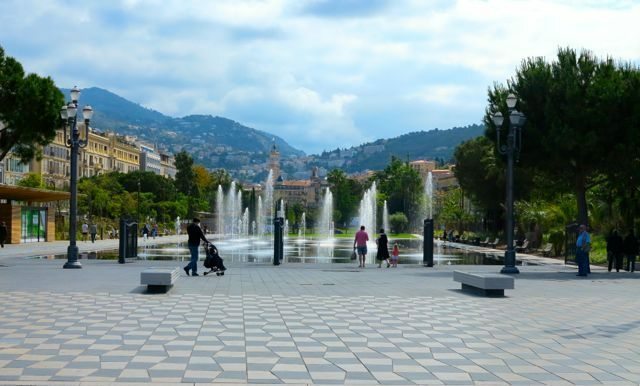 Verdict: Nice is a great base to explore the area, but it is touristy. In hindsight, we wished we’d moved on earlier and stayed in a little town nearby. Sign up to have Travelletto's monthly tips and tricks delivered direct to your inbox. Thanks and have a lovely day! * Your privacy is respected and your details won't be shared with anyone, ever. Subscribe now to receive my Margaret River Tips delivered straight to your inbox. I promise you won't be bombarded with emails. Ciao! I'm a passionate traveller, ex-chocoholic, food-lover, wino and people watcher. Eating a good meal can keep me on a high for two days. I enjoy supermarket shopping in foreign countries too - it's not weird! I always have a trip planned, always. Eat Drink Paleo is a fab paleo blog. Irena Macri's recipes are easy and her book is beautiful. Click here to visit Eat Drink Paleo. Hello! Sign up to Travelletto's monthly email and you'll receive my Margaret River Tips. Come along and follow my delicious travel adventures.